A tutorial that shows you how you can use MapKit in your iOS apps to show maps, drop pins, look up addresses, and more! 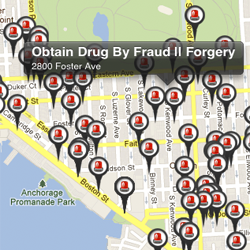 Plot Baltimore arrests data using MapKit! Note from Ray: This is the sixth iOS 6 tutorial in the iOS 6 Feast! In this tutorial, we’re updating one of our older tutorials to iOS 6 so it’s fully up-to-date with the latest features like the new Apple Maps in iOS 6 and related new iOS 6 APIs. Parts of this tutorial come from Matt Galloway‘s “What’s New with MapKit chapter” in our new book iOS 6 by Tutorials, although the book is about a different app (a subway route finder!) and takes things MUCH further than this simple example, such as registering your app as a routing provider. Enjoy! Update 9/9/12: Fully updated for iOS 6 by Matt Galloway. Update 3/19/12: Fully updated for iOS 5 by Malek Trabelsi. 3/23/11: Original post by Ray Wenderlich. MapKit is a really neat API available on the iPhone that makes it easy to display maps, jump to coordinates, plot locations, and even draw routes and other shapes on top. 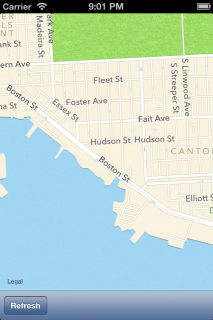 I’m writing this tutorial because about a month ago I attended a neat event in Baltimore called Civic Hack Day where I played around with MapKit to display some public data such as place locations, crime data, arrests and bus routes. It was kind of fun so thought others might be interested to learn how it works – and maybe use a similar technique with data from your own hometown! In this tutorial, we’re going to make an app that zooms into a particularly cool location in Baltimore. The app will then query a Baltimore web service to pull back the recent arrests around that area, and plot them on the map. In the process, you’ll learn how to add a MapKit map to your app, zoom to a particular location, query and retrieve government data available via the Socrata API, create custom map annotations, and more! 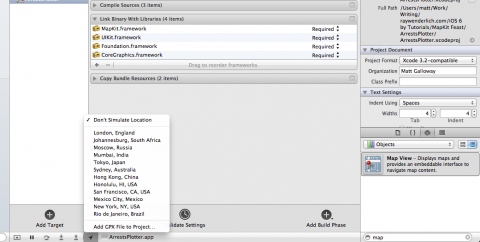 This tutorial assumes some familiarity with Objective-C and iOS programming. If you are a complete beginner, you may wish to check out some of the other tutorials on this site. This tutorial uses Xcode 4.5 with iOS 6 features such as Objective-C literals and the new mapping engine developed directly by Apple. 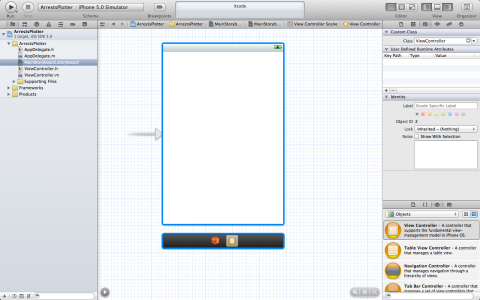 It also uses iOS 5 features such as Storyboard, ARC. You really are living at the cutting edge with us! Without further ado, let’s get mapping! In Xcode 4.5, go to File\New\New Project, select iOS\Application\Single View Application, and click Next. Then type ArrestsPlotter as the project name. Make sure Use Storyboard and Use Automatic Reference Counting options are checked. Also make sure iPhone is selected for the Devices option. Then click Next, and choose a directory to save your project in to finish. Click on MainStoryboard.storyboard to bring up Interface Builder. Then bring up the Object library by selecting the third tab in the View toolbar (Utilities) and selecting the third tab in the library toolbar (Object library), as shown in the screenshot below. From the Object library, drag a toolbar to the bottom of the screen, and a Map View to the middle of the screen, and rename the toolbar button to read “Refresh”, as shown in the screenshot below. It’s important to add the toolbar first and then the map, because if you do it that way round you’ll notice that the map automagically takes up the remaining space. It’s as if Xcode is reading your mind! Next, click on the map view you added to the middle of the screen, and click on the fourth tab in the inspector toolbar to switch to the Attributes inspector. Click the checkbox for Shows User Location, as shown below. To do this in Xcode 4.5, click on the name of your project in the Groups & Files tree, select the ArrestsPlotter target, and switch to the Build Phases tab. Open the Link Binary With Libraries section, click the Plus button, find the entry for MapKit.framework, and click Add. 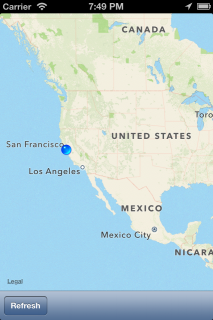 Now you should be able to compile and run your project, and have a fully zoomable-and-pannable map showing your current location (or Cupertino if you’re using the Simulator), using Google Maps! So far so good, eh? But we don’t want the map to start looking at the entire world – we want to take a look at a particular area! 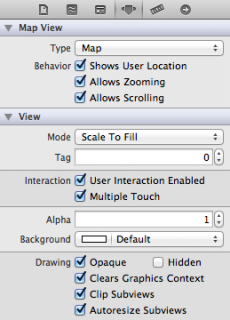 As an aside, you might want to at this point experiment with Xcode’s simulate location feature. You’ll notice that the app currently thinks you’re in Cupertino. That’s all well and good, but maybe you want to pretend you’re somewhere else far far away from 1 Infinite Loop. Although I’m not sure why you wouldn’t want to pretend you were there… Anyway, you can simulate your location by clicking the location indicator icon at the bottom of the main Xcode panel whilst the app is running. From there you can select a location. See the screenshot below for an example. 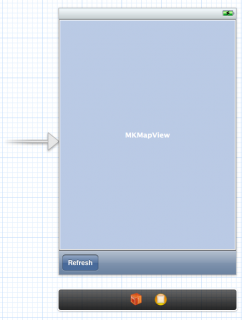 First, we need to connect the Map View you created in Interface Builder to an instance variable in your view controller. We could do this the old fashioned way (create an instance variable and property, and connect with Interface Builder by right clicking and drawing lines from the outlet to the map view), but there’s an even easier way in Xcode! To do this, select MainStoryboard.storyboard again, and make sure that the assistant editor is selected (the second tab in the Editor tab group). I like to have mine show up at the bottom – you can set the position with View\Assistant Layout\Assistant Editors at Bottom. In the toolbar at the top of the Assistant Editor, make sure Automatic is selected, and that it is set to display ViewController.h. If it’s not, click on Automatic, on the drop down list, choose Manual and look for ViewController.h like shown in the screenshot below. Now, control-drag from the Map View down to your header file, right in the middle of the @interface declaration, and before the @end. A popup will appear. Set the connection type to Outlet, the name to mapView, keep the Type as MKMapView, the Storage as Weak, and click Connect. It will automatically make a property for your map view and hook it up for you! This calls for a celebration – 3 w00ts (and one rage) for Xcode 4! There’s a lot of new stuff here, so let’s go over it bit by bit. Picks out the location to zoom in. 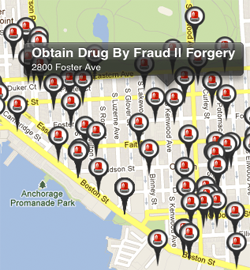 Here we choose the location in Baltimore where I initially wrote this app, which is a good choice for the BPD Arrests API we’ll be using later on in this tutorial. When you are trying to tell the map what to display, you can’t just give a lat/long – you need to specify the box (or region) to display. So this uses a helper function to make a region around a center point (the user’s location) and a given width/height. We use half a mile here, because that works well for plotting arrests data. Finally, tells the mapView to display the region. The map view automatically transitions the current view to the desired region with a neat zoom animation with no extra code required! The next step is to plot some interesting arrests data around our current location. But where in the heck can we get such stuff?? Well, it depends on your current location. Here in Baltimore, we are quite lucky because the city is working quite hard to making all city data available online, through the OpenBaltimore initiative. We will be using this dataset for the purposes of this tutorial. After you finish this tutorial, maybe look around to see if your city has an alternate dataset you can use? 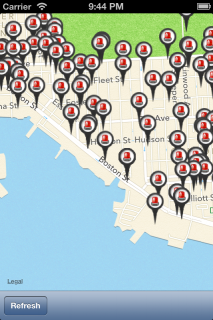 The specific dataset we’re interested in is the BPD Arrests. Using this link, you can take a peek at the raw data, and if you click Export\API, you can see the API access endpoint we’ll be using. To query the API, you basically issue a POST to the given Socrata URL, and pass in a query as JSON. The results will come back as JSON as well. You can learn more about the command and response formats in the Socrata API documentation, but you don’t really need to know the details for this tutorial. The query we need to use is on the largish end, so we’ll store it in a text file to make it a bit easier to read and edit, and do some subtitutions in the code. To save time, we’ll use ASIHTTPRequest to assist with sending/receiving data to the web service. Ok – so we’ve got a plan, but before we can begin, we need to quickly add the ASIHTTPRequest library to our project. To add ASIHTTPRequest, first download it. Once you have it downloaded, right click your ArrestsPlotter project entry in groups and files, select New Group, and name the new group ASIHTTPRequest. Then drag all of the files (but not the folders) from within the ASIHTTPRequest\Classes directory (ASIAuthenticationDialog.h and several others) into the new ASIHTTPRequest group. Make sure “Copy items into destination group’s folder (if needed)” and “Add to targets -> ArrestsPlotter” are selected, and click Finish. Also repeat this for the two files (Reachability.h and Reachability.m) in ASIHTTPRequest\External\Reachability, as these are dependencies of the project. To add MBProgressHUD, first download it. Once you have it downloaded, right click your ArrestsPlotter project entry in groups and files, select New Group, and name the new group MBProgressHUD. Then drag MBProgressHUD.h and MBProgressHUD.m into the new MBProgressHUD group. Make sure “Copy items into destination group’s folder (if needed)” and “Add to targets -> ArrestsPlotter” are selected, and click Finish. The last step is you need to link your project against a few required frameworks. To do this, click on your ArrestsPlotter project entry in Groups & Files, click the ArrestsPlotter target, and choose the Build Phases tab. Click the plus button, and choose CFNetwork.framework. Then repeat this for SystemConfiguration.framework, MobileCoreServices.framework, and libz.dylib. Note that, so far, if you compile the app you will run several error messages like – autorelease is unavailable, retain is unavailable and ARC forbids explicit message send of ‘release’ and many others around the ARC feature. Actually, projects with Automatic Reference Counting (ARC) enabled can use ASIHTTPRequest. However, since ASIHTTPRequest’s codebase does not use ARC, you will need to add compiler flags to get everything working. This is pretty easy. 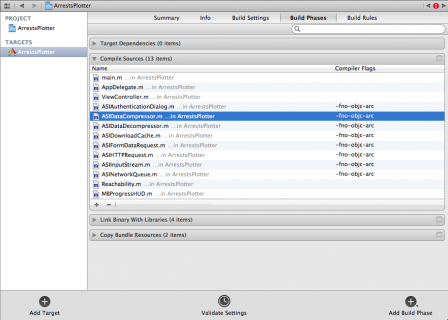 In Xcode, go to your active target and select the “Build Phases” tab. In the “Compiler Flags” column, set -fno-objc-arc for each of the ASIHTTPRequest source files (including Reachability.m). Compile your project just to make sure you’re good so far, and now we’re back to the fun stuff! You will notice a few warnings coming from ASIHTTPRequest and MBProgressHUD which you can simply ignore. They are just there because it hasn’t been fully updated yet to support the new iOS 6 SDK. First, download this resource file which contains a template for the query string we need to send to the Socrata API web service to get the arrests near a particular location. When you get the file, unzip it and drag command.json into your ArrestsPlotter\Supporting Files group, make sure “Copy items into destination group’s folder (if needed)” and “Add to targets -> ArrestsPlotter” are selected, and click Finish. Next, you need to set up the “Refresh” button on the toolbar to call a method, so you know when it’s tapped and can search for the arrests data around the current location. Again, you could do this the old way (make an IBAction outlet and connect with Interface Builder), but you might as well use the new super-duper, automagic way! To do this, click MainStoryboard.storyboard, select the Refresh button, and control drag from the button to ViewController.h, to the line right after the mapView outlet. Change the Connection type to Action, the Name to refreshTapped, keep the Type as id, and click Connect. Xcode will automatically create the method for you in both the header and implementation, and connect it too! Let’s review this section by section. Gets the lat/long for the center of the map. Reads in the command file template that you downloaded from this site, which is the query string you need to send to the Socrata API to get the arrests within a radius of a particular location. It also has a hardcoded date restriction in there to keep the data set managable. The command file is set up to be a query string, so you can substitute the lat/long and radius in there as parameters. It has a hardcoded radius here (0.5 miles) to again keep the returned data managable. Creates a URL for the web service endpoint to query. Creates a ASIHTTPRequest request, and sets it up as a POST, passing in the JSON string as data. Sets up two blocks for the completion and failure. So far on this site we’ve been using callback methods (instead of blocks) with ASIHTTPRequest, but I wanted to show you the block method here because it’s kinda cool and convenient. Right now, these do nothing but log the results. Finally, starts the request going asynchronously. 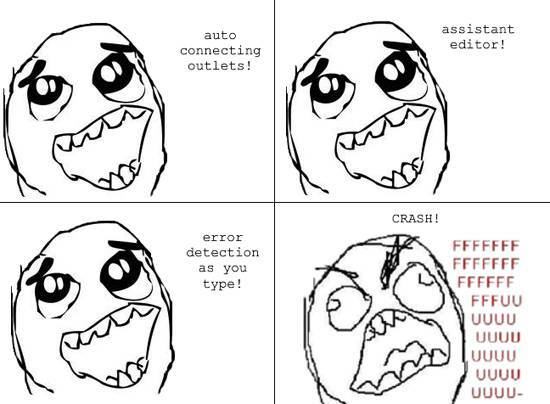 When it completes, either the completion or error block will be executed. Ok so now that we have interesting data points to show, all we have to do is add them to the map! The important code here is inside the new method, plotCrimePositions. It first removes any annotations already on the map so you start with a clean slate. Then it parses the response string as JSON, and pulls out the interesting info from it (lat/long, arrest description, etc), given the hardcoded offsets at which this data appears in the JSON results. Once it’s pulled out the interesting data, it creates a new MyLocation object and adds it as an annotation to the map view. Ok, onto the third and final step! First select MainStoryboard.storyboard. Then set the View Controller (right at the top of the list) as the delegate of the map view by control clicking on the map view, and dragging a line from the delegate entry to the View Controller. This is the method that gets called for every annotation you added to the map (kind of like tableView:cellForRowAtIndexPath:), that needs to return the view for each annotation. Also similarly to tableView:cellForRowAtIndexPath:, map views are set up to reuse annotation views when some are no longer visible. So the code first checks to see if a reusable annotation view is available before creating a new one. Update: One extra thing to point out about this, suggested by Kalgar (thanks man!) Note that when you dequeue a reusable annotation, you give it an identifier. If you have multiple styles of annotations, be sure to have a unique identifier for each one, otherwise you might mistakenly dequeue an identifier of a different type, and have unexpected behavior in your app. It’s basically the same idea behind a cell identifier in tableView:cellForRowAtIndexPath. Here we use the plain vanilla MKAnnotationView. It uses the title and subtitle of our MyLocation class to determine what to show in the callout (the little bubble that pops up when you tap on it). Note we customized the annotation so that it shows an image, for fun. Speaking of an image, be sure to download this custom image and add it to your project. And that’s it! 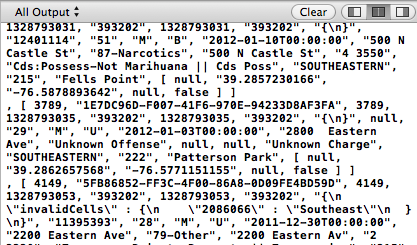 Compile and run your code, and now you should be able to zoom around Baltimore searching for arrest! Wanna try out a cool new feature in iOS 6? You can now easily launch the Maps app right from within your app, with parameters to configure exactly what to show! You’ve now made it so that in the callout when a pin is tapped on, there will be a button on the right hand side. When this is tapped, the mapView:annotationView:calloutAccessoryControlTapped: method is called. In this method, you grab the MyLocation object that this tap refers to and then launch the Maps app by calling the openInMapsWithLaunchOptions: method. It’s as simple as that! You’ll notice that a dictionary is passed in to this method. This allows you to specify a few different options; here the directions key is set to driving. This will make the Maps app try to give driving directions from the current location to this pin. Neat! I suggest you take a look at the various different options you can pass in the launch options dictionary. Also take a look at the class method on MKMapItem to allow you to pass multiple MKMapItem objects at the same time. Now build & run the app, perform a refresh and tap on an arrest item. Then tap the blue button on the right and watch it launch the Maps app to show that arrest, with driving directions to it. Very cool :]! Note: You may have gotten an error when opening the Maps app. If so, it’s likely because it couldn’t get driving directions for some reason. 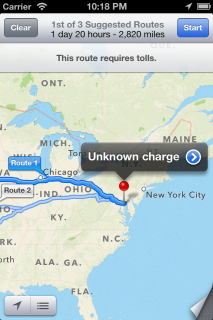 To fix that, simulate your location as being somewhere in the US (e.g. San Francisco) and try again. This time it’ll work and show you directions from downtown San Francisco right to the arrest! Now you know the basics of using Map Kit, but there’s a lot more you can do from here, including geocoding, adding custom map overlays, and more. A great place to go to for additional information is Apple’s Location Awareness Programming Guide. To take this app further you may want to look into the MKMapItem class method I hinted at for opening the Maps app with multiple items. Perhaps add a button to the toolbar that opens the Maps app with all of the arrests currently shown. Also, why not take a look at the other launch dictionary options to control what happens when Maps opens. If you want to learn more the new MapKit features in iOS 6, including registering your app as a routing provider, you should check out our new book iOS 6 by Tutorials. The book contains a chapter on MapKit that covers how you can launch Maps with various options, and how you can register your own app as a routing provider to give directions to users! This is a blog post by iOS Tutorial Team members Matt Galloway, Adam Burkepile, and Ray Wenderlich.